We did a lot of work in the cloud during the winter and spring 2014. Seven years ago we started to develop our sales-friendly Virta CRM, and now we wanted to make it compatible with the Microsoft Azure cloud services. This way we would be able to offer Virta CRM to our customers from the public cloud. The most important KPI for us is customer satisfaction. We continuously strive to improve our services to make our customers even happier. During the past few years it’s become obvious that the demand for B2B cloud services has also increased, and the services that used to run in closed environments are being moved in to the cloud. The primary reason for the transition is money: it’s expensive to maintain your own IT infrastructure and resources, and cloud can really save a buck. At the same time it’s clear, that maintaining bigger systems in the private cloud requires expert resources that are automatically included in the public cloud. In addition, confidence towards public cloud services is in general on the increase among companies. The Service Level Agreements (SLAs) and information security policies public cloud services offer are already on a level that can be difficult to achieve in private cloud or in company’s own infrastructure. This is why we wanted to make it possible for our customers to access Virta CRM also from the public cloud. Azure makes it possible to scale server resources according to our needs. We can, for instance, increase capacity during the weekly rush hours, which provides better performance for the applications. Azure automatically saves all the data to multiple stand-alone servers, so even if one rack brakes down, customer’s data is still safe. The system also makes an asynchronous copy of the customer data to another data center situated in the same geopolitical area. This further decreases the risk of losing business-critical data. Azure always has the most up-to-date versions of all the operating systems and platforms (SQL Server etc.). The information security of Windows Azure is top-notch. Based on our research, Microsoft has already made big investments on Windows Azure cloud platform and will continue to do so in the future. The investments will ensure wider possibilities and better user experience compared to other Windows-based cloud service providers. We finalized the planning of the Virta CRM Azure update during early spring and the environment was deployed by the end of May. As a result, we’re now able to run our Virta CRM service in Microsoft Azure, and we can offer our customers high SLAs and a secure and risk-free service environment. Our cloud team encountered many positive surprises during the project. For example, Azure makes it really easy to back-up data and optimize settings related to information security and performance. All the monitoring features can be configured straight from the web interface and setting up service alerts is just as simple as our team hoped for. We strongly believe that Cloudriven’s customer satisfaction will increase with this update. The above layout design appeared on my desk in April 2007 (check also the marketing video!). My team’s task was to disguise the boring CRM system as a game in which the player would be guided towards the organizational goals by providing incentives from the system. Gamified CRM sounded like a utopian idea six years ago. Not that we wouldn’t be able to technically implement it, but would the Finnish sales organizations be interested in buying it? Anyhow, the application was implemented and in the end of the year 2007 the first BLARP demo saw daylight. The application was named BLARP which was an abbreviation of the words Business Live Action Role-Playing. The first demo version didn’t look exactly the same as the above layout but it had all the necessary elements for playing the game. The first customer deployment was carried out in the beginning of 2008. Some of our customers still use BLARP, although most of them have migrated to the next version which is called Virta (Flow). There are a few chilly stories to tell concerning the first BLARP deployments in the winter 2008. During one of the many deployments I was on a trip in India. One of my team members was performing deployment tasks in Finland and ran into trouble. It happened to be so that I was just experiencing the rough reality of Indian traffic on the backseat of a local taxi when my colleague called. Our driver Desai defied the laws of physics with his two-cylinder Tata while I was at the same time discussing on the phone about the status of the BLARP deployment. I was afraid that we would run over some Indian family and get all of their belongings on our car top. Meanwhile in our cozy Helsinki office, our unit’s supervisor was breathing down my team member’s neck and I could almost hear his heavy sighs on the backseat of my Orient express. In any case, we pulled through the situation and BLARP was successfully deployed for the customer (and the customer in question is still using BLARP!). Lots of water flowed in Ganges during 2008 and 2009 and our product development team continued to work on the development of BLARP. We released a new version of the product four times a year which is the practice still today; new version is released quarterly. Gamification itself proved to be a concept only rare organizations were ready for. The main attraction of BLARP was the new user-interface and gamification and the gamified elements of BLARP were very unfamiliar in sales organizations. The concept of giving points for reporting sales activities didn’t arouse a lot of interest. 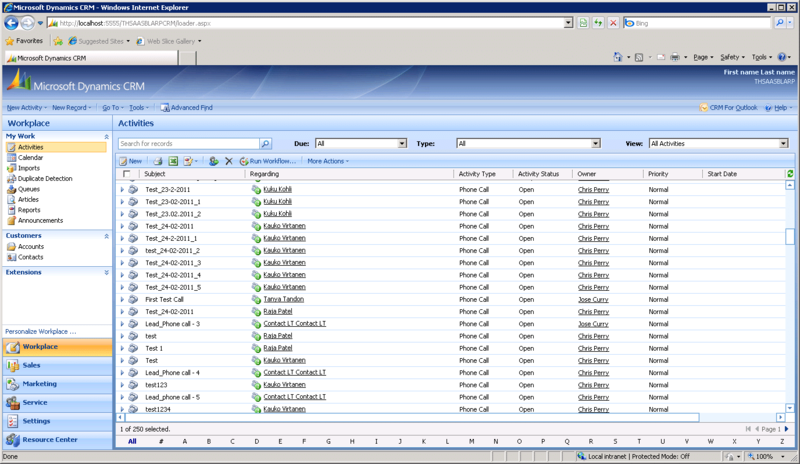 Major milestone in development was achieved in the summer 2011 when the user-interface of BLARP was completely redesigned. The name BLARP was also abandoned and the new version was named Virta (Flow). The basic principles of Virta were the same as in BLARP. 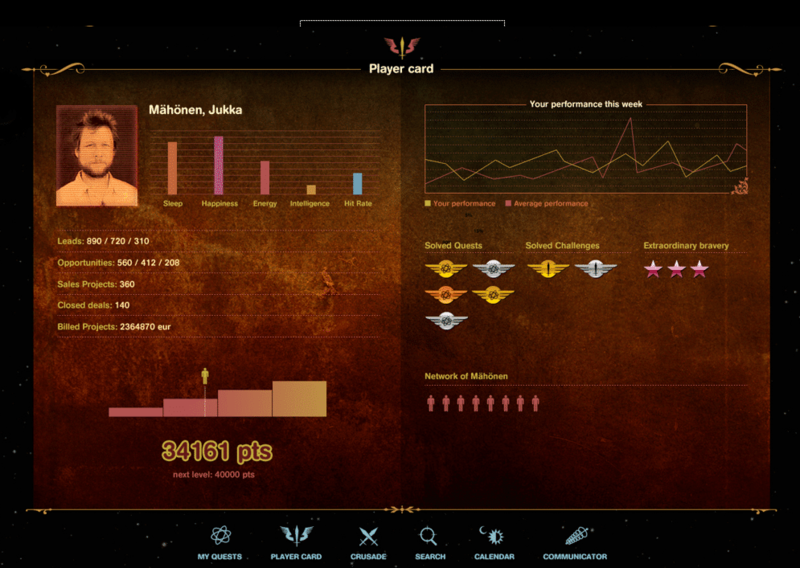 The gamified elements, such as points, player card and leaderboard, were still part of the product. The legendary motor used for counting points in BLARP was also retained. The component was designed to manage all kinds of calculation tasks even remotely related to points from the very beginning. You just had to input the arguments for counting points from one end and you’d get a completed player card or leaderboard from the other end. Virta contained numerous new features compared to BLARP. However, the biggest investment was the new user-interface which was made as simple as possible, it guided the user and worked also in mobile devices. A couple of years ago gamification still wasn’t a familiar concept in the Finnish CRM scene. Most of our Virta customers were yet again mostly pleased with the fresh and different UI compared to traditional CRM systems. At the same time gamified business applications started to arouse interest in the global market. The development of Virta has continued from the summer of 2011 until this day. New versions and features are introduced every quarter year and we’re proud that the foundations of the product were laid as early as 2007. Globally the interest in gamified business applications is now very high. We’ve acquired a lot of useful experience in gamification during the six years we have been developing BLARP and Virta. Our customers have given us valuable feedback and we’ve tried to implement new gamified features based on the feedback. Although one strong concept related to gamification has been missing: namely the idea that the player could do something with the points collected. This has been one of the reasons why we’ve been developing a new product called Habit. Habit helps you to gamify processes traditionally performed in business applications, for example in CRM. Players or teams set goals and the game is to strive to achieve these goals. The application guides the player or team to carry out activities relevant to the set goals. The concept of Habit also includes the Points Store: organization can define what single player or team can do with the points collected. For example, if you could buy work with the points, a hardworking employee who has collected enough points could outsource her tasks to other employees by buying work performance from the Points Store. Since the birth of BLARP, social media has become ever so popular. A social wall similar to Facebook was implemented in Virta, so that the activities concerning customer management and tasks could be more easily found by users. The social features in Habit are taken even further: content can be shared and you can receive points from sharing. Organization gets valuable publicity and users get valuable points. This is the third gamified system I’ve had the pleasure to work with in my career. It is absolutely amazing to be part of the team working on this application and to use all the experience we’ve acquired from BLARP and Virta over the years. Instead of looking into the history of gamification, we can now concentrate on the future! Tuomas is in charge of Cloudriven’s customer deployments and project delivery. You can follow his thoughts also on Twitter. The new version of Virta was published in mid April. All of our Virta clients have already taken it into use. The new version improved the performance of Virta: over 60 % improvement in speed has been measured in performance tests. Do you still use Virta’s predecessor BLARP? Virta has all the versatile features of BLARP and more. Contact us and ask more about updating to Virta!